Today marks an important step forward in the protection of forests with the launch of the first high-quality and affordably priced straw-based copy paper in the U.S., Step Forward Paper available exclusively on Staples.com and for order in Staples stores, through in-store kiosks. 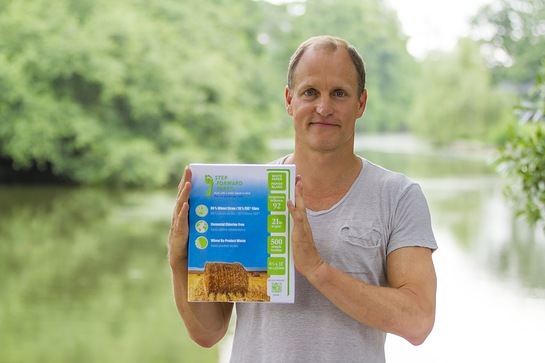 Step Forward Paper is revolutionary copy paper made up of 80 per cent wheat-straw waste and 20 percent Forest Stewardship Council (FSC) certified wood fiber. Buying two boxes of Step Forward Paper instead of copy paper made from virgin forest fiber saves one tree. A landmark Life Cycle Study comparison research report by Offsetters, a leading North American carbon management solutions provider, was commissioned by Prairie Pulp & Paper Inc. to provide consumers with access to objective measures of the relative positive and negative impact of different papers on the environment. The research results show wheat-straw based paper and 100 per cent recycled tree-fiber paper types have the lowest environmental impact across the seven indicators studied. Step Forward Paper is presently made at a mill in India identified through an exhaustive international search as the only one having the capacity to make 80 percent ag-fiber paper that is elemental chlorine-free with FSC-certified wood fiber. “Our goal is to establish a market that will support our plans to build a new state-of-the-art facility in North America, which will in turn enable us toproduce this straw paper with an even smaller footprint,” said Jeff Golfman, president of Prairie Pulp & Paper Inc.
North America is home to seven of the 10 largest intact forest ecosystems left in theworld. These forests contain vast quantities of the world’s unfrozen fresh water and are among the largest storehouse of carbon on earth. The absorption and storage of carbondioxide by intact forests influences climate change. Canopy, an award winning not-for-profit environmental organization, has been a catalyst for change in the development of the market for environmentally responsiblepapers and a driver in the introduction of straw paper fiber throughout North America.